is the American English Doctor. May Day Eve is an important date in the pagan calendar. In Celtic paganism it is the date of Beltane. In Germanic lore, it has become known as Walpurgisnacht. For the Romans it was the Feast of Flora. Although originally a pagan festival, Walpurgis Night got its name–Saint Walpurga’s Night– from a Christian saint. Statue of Saint Walburga in the church of Contern, Luxembourg. The saint’s attributes are a bishop’s crozier to signify that she was an abbess, and a vial of oil which refers to the healing oil that oozes from her tomb in Eichstadt. Saint Walburga (c. 710-779) was an English nun who went to Germany in the 8th century to assist her brothers and their uncle Boniface in missionary efforts. St. Walburga’s feast day in the Roman Christian calendar is February 25, but her name has become attached to May 1 because on that date her remains were transported from her tomb at Heidenheim to a church near Eichstadt. 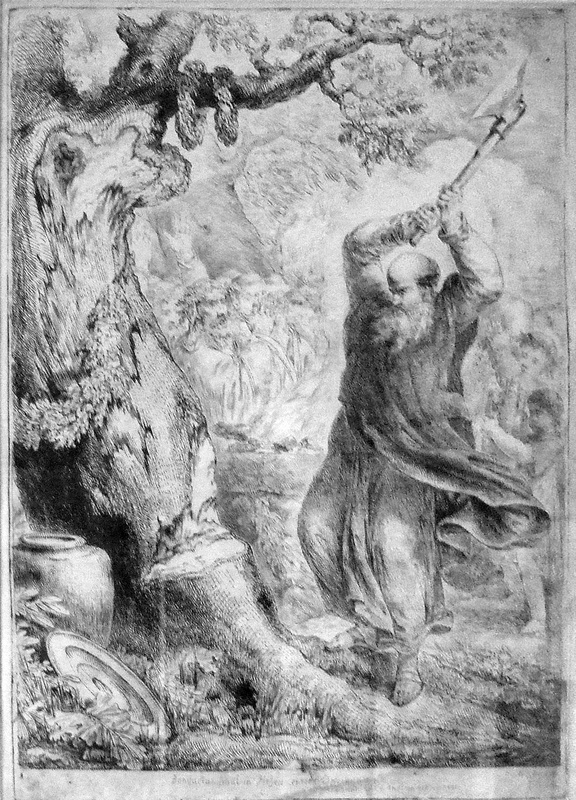 Boniface chops down the sacred oak. Engraving by Bernhard Rode, 1781. A tree hugger from an early age, I remember the feelings of outrage I experienced when I was taught how Saint Boniface chopped down an enormous oak tree sacred to the pagan Germans. The intention of the lesson—to make me an admirer of a courageous Christian saint—entirely missed its mark. Indeed, I have always harbored a particular dislike of Boniface. Did he have any idea of how long it had taken that oak to reach that size? Or of how much those Germans loved it and what a hole it would make in the landscape? I think there’s poetic justice in the fact that the name of Boniface’s niece has become attached to a pagan festival. Thanks to the Faustus legend popularized by Goethe and Marlowe, Walpurgisnacht has also come to be associated with the Devil and his go-between, Mephistopheles. 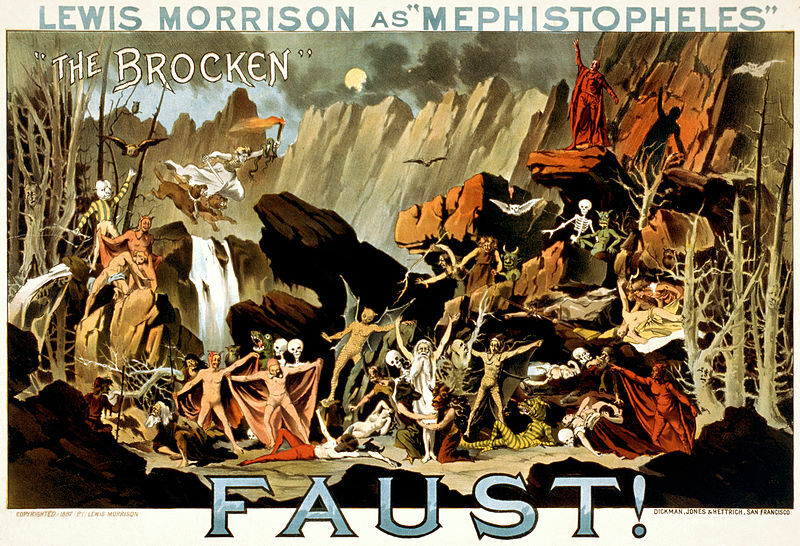 1887 performance poster. The Brocken is a German mountain associated with Walpurgisnacht activity. Library of Congress Prints and Photographs division ID var.0694. Chernabog wreaking evil on Walpurgisnacht in Disney’s Fantasia (1940). Walpurgisnacht features in Disney’s original Fantasia (1940) in the segment in which Leopold Stokowsky directs a Rimsky-Korsakov arrangement of Mussorgsky’s Night on Bald Mountain. 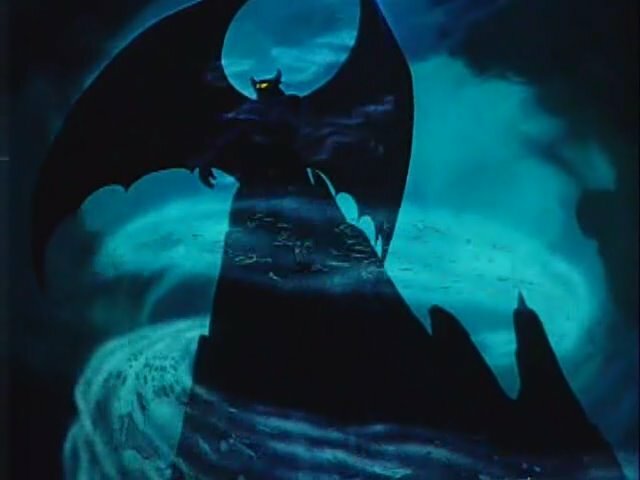 Mussorgsky’s original composition referenced the summer solstice (Saint John’s Eve), and American viewers of Fantasia tend to associate the piece with Halloween, but the Disney action takes place on Walpurgisnacht, May 1. The evil figure is named Chernabog and Bela Lugosi served as a model.